Beijing (AFP) - As she nears retirement along with millions of other Chinese, He Xiangying is too busy sending her son money and raising a stranger's child to worry about who will eventually look after her. The nanny's plan is to work until her health fails, then go back to her home village in the Chinese countryside and grow vegetables to save money. She holds out little hope of help from her jobless son. "If he isn't doing well for himself then why would he support his ageing parent?" 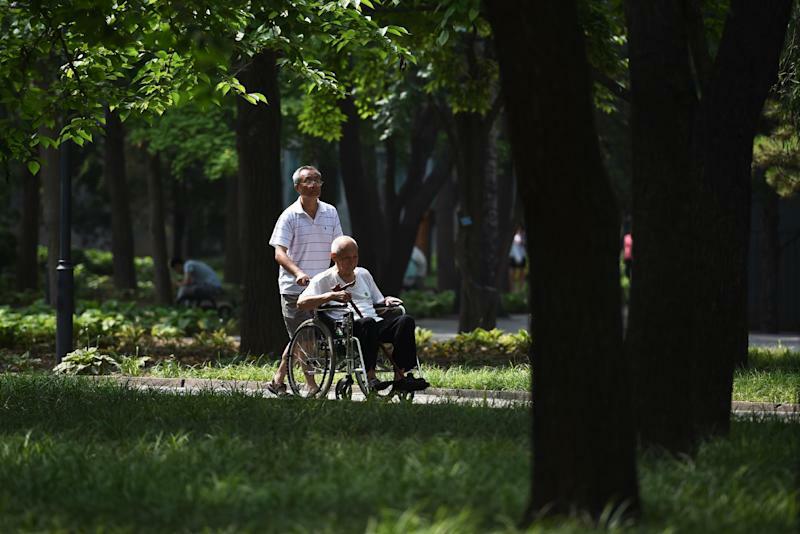 said He, a 51-year-old widow, tearing up while her charge rested in a stroller under the shade in a Beijing park. "I will take care of myself." China's elderly population is expanding so quickly that children struggle to look after them while caregivers are either unaffordable or unavailable -- prompting a scramble for solutions, even ones bucking age-old traditions that families should care for their own across the generations. Projections show that 350 million Chinese -- one in four of the population -- will be aged 60 or older by 2030, almost twice as many as now. That monumental shift, fuelled by the one-child policy, will impose a huge burden on the country, shrink the labour force that has fuelled its growth, and put the responsibility for multiple grandparents onto a single grandchild. Many of those young adults are -- like He's son -- already struggling with sky-high housing prices and slowing economic growth. "Those children who are poor, whether you live or die they cannot do anything for you," she said, as fellow nannies manned other pushchairs nearby. 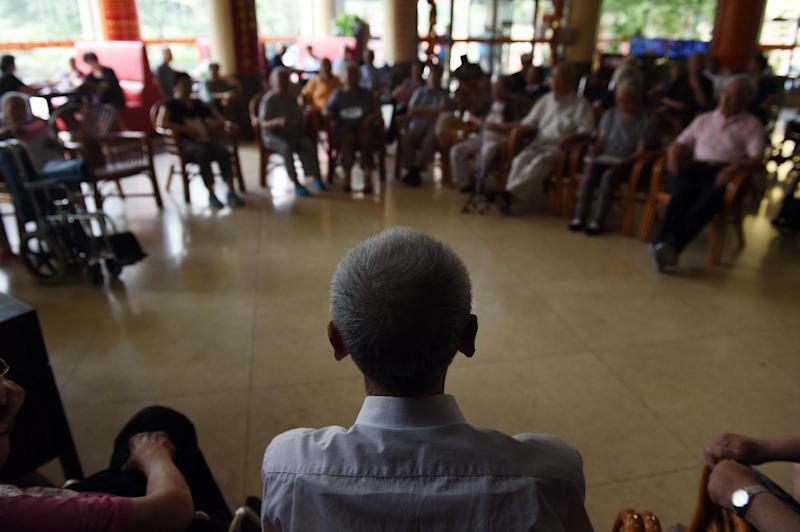 China is still only piloting schemes, such as care homes and financial products, to provide care for the elderly and help them pay for it -- at present the country has only 25 care beds for every 1,000 senior citizens, civil affairs minister Li Liguo said this week. 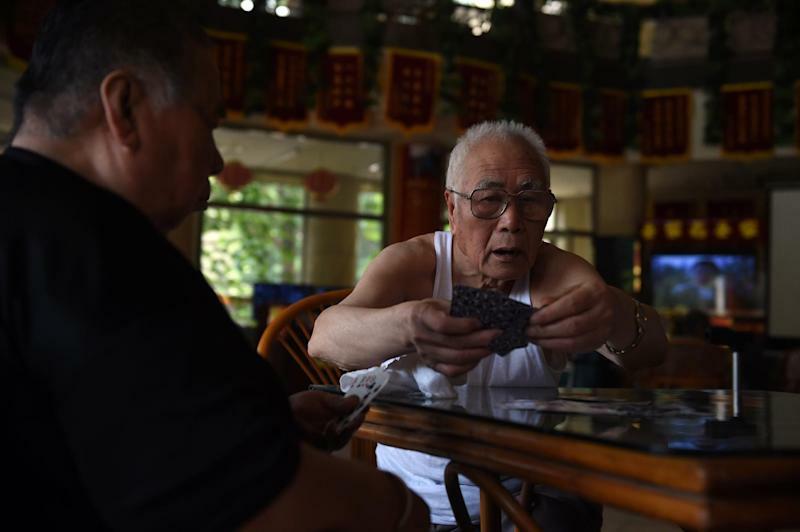 "This will be an era of a great institutional experiment for facing China's ageing challenge," said Wang Feng, a demographics expert with the Brookings Institution. "This is not something China has encountered in the past," he said. "The pressure is building up. It's just going to get greater and greater." In Chinese culture children should look after their ageing parents, though the idea is losing sway under the pressure of modern life. On the outskirts of Beijing, a three-star hotel has been converted into the Yiyangnian nursing home, a 300-bed complex of plain rooms and quiet hallways, where residents occupy themselves playing mahjong and cards. "If I were living at home it would be so lonely," said Zhou Chuanxun, who has been living at the facility for two years. "Here at least I can have conversations with other people. It's better here. Time passes quicker." His son and daughter "both have good jobs" and are too busy to look after him, he added. The home charges up to 8,000 yuan a month, says owner Wang Yun -- far beyond the budgets of most Chinese families. Staffing poses another problem, as young Chinese starting careers in their fast-modernising country find the idea of bathing and feeding old people unappealing. Authorities have sought to encourage such projects but only expect three percent of China's elderly to be accommodated in homes. And as in other countries, they are stigmatised as depressing waiting rooms for death. At the park, a man in his 60s surnamed Zhang gossiped with friends about an ailing acquaintance just sent to a facility. "It's like a tomb," he said. Another man playing a harmonica added: "Old people are not willing to leave their home. No matter how good the senior home, it's not a home." The government expects the vast majority of the elderly to stay in their houses and perhaps hire a caregiver to help them. But meeting the cost of such assistance remains a challenge, especially in poorer rural areas. Various schemes floated so far -- including increasing pension contributions or raising the age of retirement, which generally comes at 60 for men and 55 for women -- have faced resistance. Four major cities began piloting schemes this month that confront tradition by encouraging people to sell their houses for a regular income, surrendering possession at death or when their full value has been paid out, instead of keeping them in the family. "No way," said a woman surnamed Chen. "You should leave something to your children." Solving the problems will take time -- which is in short supply, said Yanzhong Huang, a China healthcare expert at the US-based Council on Foreign Relations. "I haven't seen any government reports saying 'this was a very successful experiment, let's popularise it nationwide'," he said. At the park a 79-year-old man in sunglasses stretching his hamstring on bright blue exercise equipment said his solution was to stay healthy. "As long as I can look after myself I will," he said as others around him bent and twisted on the machines. "If you get sick, you are in pain, and your kids have to bear the burden."